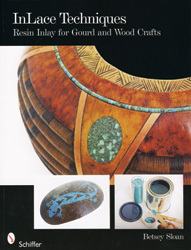 This is the first comprehensive book written on the uses of InLace® resin inlay for gourd artists and woodturners. Chapters present carving techniques in gourds, mixing resin, insetting, sanding, and polishing. The most common challenges working with resin inlay are addressed and ten gourd artisans and a woodturner share their experiences. An extensive gallery of gourd and wood turned art will inspire readers to add personal touches to their projects.